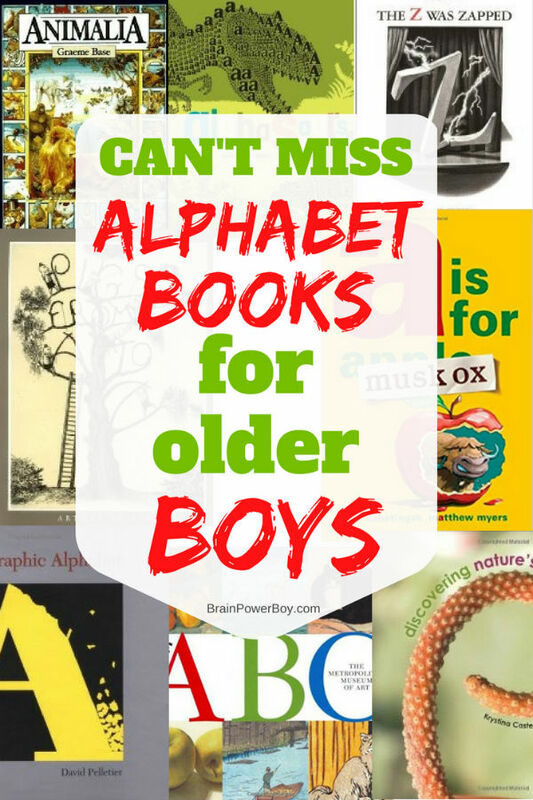 Should your boys still be reading alphabet books as they get older? You bet! Alphabet books are not just for children who are learning their ABCs. There are some beautifully done alphabet books for older readers. My son and I just went through a big stack of alphabet books to find the best ones for you. All of these books are good choices for boys. See our best books for boys list for more ideas. 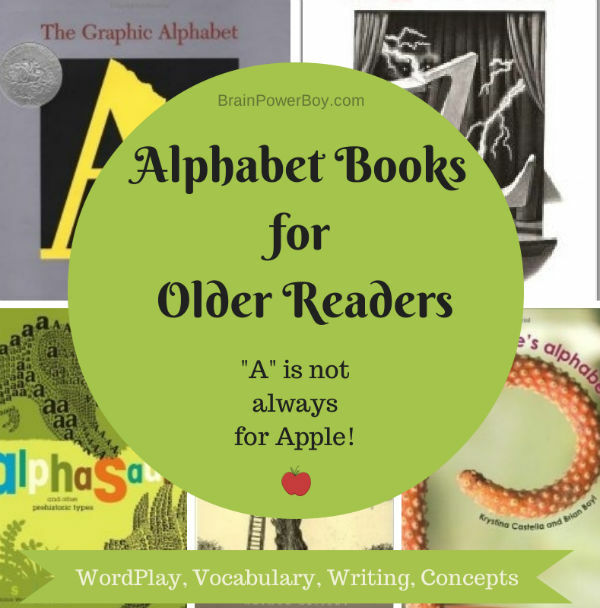 Why would you want to use alphabet books with older readers? I’ll give you a few reasons. You and your boys will likely enjoy the wordplay found in these books. The wordplay in many alphabet books introduces new words or unusual combinations of words. We laugh (or groan) when reading a well-written phrase. Alphabet books for older readers are also great for increasing vocabulary. Understanding different ways words can be used increases our boys’ ability to communicate. Alphabet books are great for cementing concepts or introducing new information. By this I mean that a child who is interested in history might find a book like the ABC Book of Early Americana to be helpful in learning so much more about the topic. E is for Ear Trumpet, Ell-Rule and Election Torch . . . see what I mean? Boys can then take what they learned about in an ABC book and expand further on it if it piques their interest. Alphabet books can also be used for encouraging reading and writing. These books usually use only a few words to describe things. This can be good for writers as they learn to be descriptive and pare down their words to choose the very best ones. It can also benefit those who don’t like to see a lot of text on a page. Some of the alphabet books for older readers found here can say a lot without a lot of writing. The illustrations speak volumes. A bonus is that the illustrations in alphabet books for older readers are particularly engaging and impressive. Because our site is geared toward boys, these books were picked out especially for boys. A is for . . .? A Photographer’s Alphabet of Animals by Henry Horenstein. A letter and a photograph—no text. The photos are black and white and show only part of an animal. We got a few wrong (lol) because this one isn’t quite as easy as some of these types of books where the animal is quite obvious. Grab it from a library if you can find it. It is worth searching for. Antics: An Alphabetical Anthology by Cathi Hepworth. Good words, fun images. The word for each letter has an “ant” in it J is for Jubilant! The images are unusual—a quick read. Antics! When you are reading alphabet books for older readers you will be amazed at what you see, learn and experience. I encourage you to try a few of these books and see what your older reader thinks. I know my son and I enjoyed them—we hope you do too. If you and your boy have a favorite alphabet book for an older reader, please leave a comment below. We would love to have a look. We might even add it to the list. See all of our great book lists for boys as well! Oh yes, time flies by and I keep remembering back to when my son was young and we used to do certain things like an alphabet walk. Thanks for stopping by. That Nature’s Alphabet one looks interesting! My daughter hates alphabet books because most of them are written for such a younger audience, but these look just right for her! Yes, Nature’s Alphabet is a great book. We really liked it. Hope your daughter enjoys it as well. Love this list Sheila! Animalia looks like a good one. I’ll need to add it to our collection. Thanks for sharing! Oh yes, that is a favorite. I hope you like it 🙂 Thanks for the comment. Some great alphabet books I have not seen. We will check these out! Glad you found some new alphabet books Jamie. I agree about alphabet books for older children. I think they are almost better suited to children who have at least a bit of a grasp on letters rather than for younger children just trying to learn letters. Thanks for the recommendations. A few new ones to add to my wish list: Museum ABC, Animalia, and Discovering Nature’s Alphabet. Thanks! Glad you found a few new ones. We went through a huge! stack of books to narrow down the best ones for older readers. This is great Sheila! I will have to get some of these from the library over the summer. Thanks Amanda. Hope you and your family find some that you enjoy. Thanks for the share! So glad to hear you love the list. I still love alphabet books and seek out new ones on a regular basis. These are great suggestions. Have you read Oliver Jeffer’s Once Upon an Alphabet? Thanks :), No but I just popped it onto my ongoing list of books to look into. Appreciate the suggestion.